Like any engineered system, electrical power distribution systems cannot be designed and constructed to operate 100% of the time indefinitely. NFPA 70B states that: “Electrical equipment deterioration is normal, and equipment failure is inevitable. Unchecked, the deterioration process can cause malfunction or [power system] failure.” Put another way, ‘check’ on the condition of your power system to reduce the potential for downtime! Why? Because there is an indirect relationship between risk and reliability. As risks increase, reliability decreases and vice versa. Whether for a relatively new power system or for an older existing installation, an assessment of the system condition can mean the difference between an electrical power distribution system that operates as designed and intended and one that does not. Having a power system assessment performed will establish the current condition of your electrical system, including identifying at-risk or obsolete equipment. Performed by a professional engineer, a power system assessment also: 1) determines the vulnerability of a facility or process to the adverse effects of unplanned downtime; and 2) establishes a baseline for future maintenance and testing, upgrade and/or expansion activities. More importantly, safety and compliance issues are also identified. 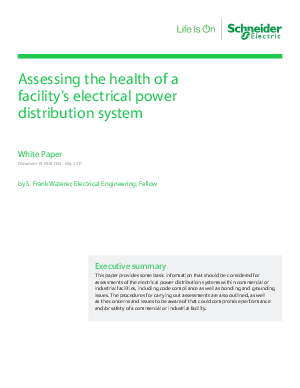 For more information on Power System Assessments, including recommendations about onsite data collection, download our white paper, "Assessing the Health of a Facility's Electrical Power Distribution System".